The JW"_ GripSoft"_ Pin Brush is the perfect everyday brush for medium and long coat breeds. The Gripsoft Pin Brush comes equipped with a rubber-sheathed handle design, which offers extreme comfort and precision. 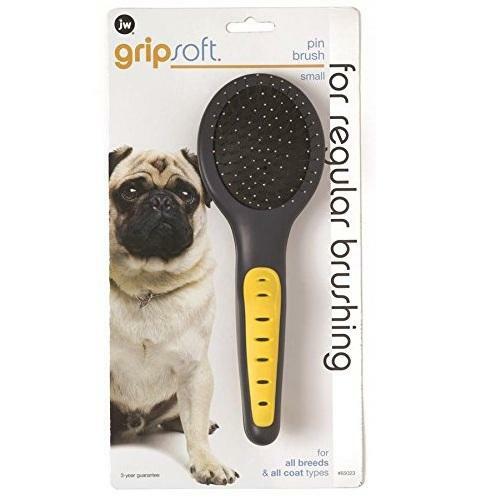 GripSoft technology features non-slip grips which are made to optimize comfort and control while grooming your pet. An oval head with long round tipped bristles are more gentle on your dog's skin and gently untangle mats and smooths out fur. The non-slip ergonomically designed handle is also more comfortable on the hand making grooming a more pleasurable experience for you.